Students Push College Fossil Fuel Divestment To Stigmatize Industry As a way to fight climate change, students at hundreds of campuses are pushing their colleges to divest from fossil fuels with sit-ins. But critics say divestment is the wrong tactic. Freshman education major, Josh Medel, has his picture taken by alumna Anjali Cadambi for social media. In the past few years, students at hundreds of colleges and universities have started pushing their schools to divest from fossil fuel companies as a way to slow climate change. The campaign has had some notable wins in the past year. But at tiny Swarthmore College, outside of Philadelphia, where the movement was born, students have been staging a sit-in for nearly a month to try to make their voices heard. On the first day of an extended sit-in at the elite liberal arts college, dozens of students are crowded into a hallway outside the finance offices, learning a new protest song. "We're asking for our school to sell its holdings in the top 200 coal, oil and gas companies," senior Sara Blazevic says. "Divestment is a way for our school, as a institution with a lot of social standing and a lot of clout, to stigmatize the fossil fuel industry." That stigma is key. Climate change activist Bill McKibben, who visited Swarthmore on day eight of the sit-in, explained that divestment isn't meant to stop the flow of cash to well-capitalized energy companies. "No one's under the illusion that if Swarthmore or any other college sells its shares in Exxon, that will immediately bankrupt Exxon," he says. "What it will do is begin the process, further the process, of politically bankrupting them." By that, he means creating a world where campaign contributions from fossil fuel companies will carry the same stigma as cash from Big Tobacco. "Making it much harder for them to dominate our political life the way they have," McKibben adds. "Because this is the richest industry on earth, it has way more political influence than it deserves." Swarthmore's divestment movement began back 2011, says Sara Blazevic. "When our campaign started, it was sort of scrappy," she says. "It didn't have a ton of support, we didn't have a network the way that the divestment movement has a network now, and then it grew really quickly." 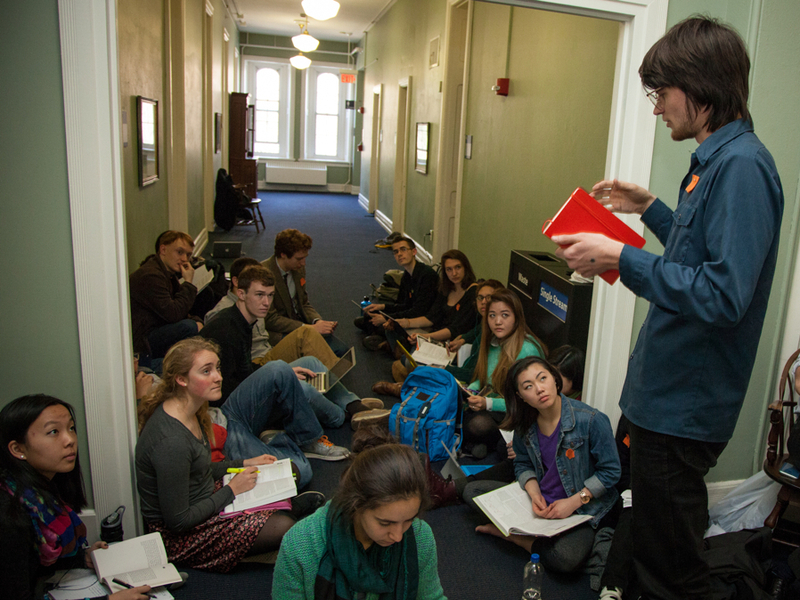 Hundreds of schools now have divestment campaigns. They have been successful at about two dozen U.S. colleges and universities, most recently at Syracuse, the largest endowment to date to commit to fully divesting. Alumnus Will Lawrence of the Fossil Fuel Divestment Student Network came back to Swarthmore to help the students effectively communicate their protest to the school's administrators. 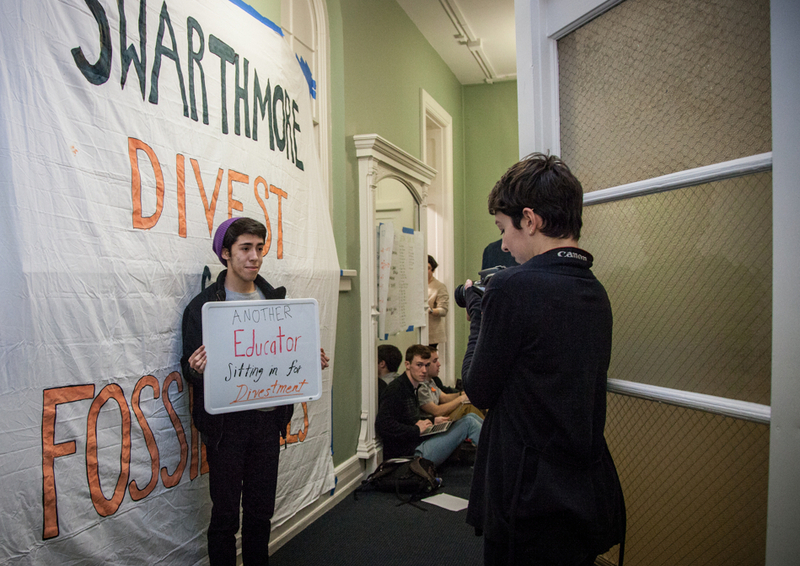 Most other schools have said "no" to divestment, including Swarthmore in 2013. "Primarily because we thought divestment would be too costly," says Gil Kemp, chair of the school's Board of Managers. He says it would cost the school's roughly $2 billion endowment $11 to $15 million a year in returns. What's more, he argues stigmatizing fossil fuels won't reduce the amount of carbon released into the environment. "Reducing our carbon footprint is a more effective way of dealing with this very real issue of climate change and global warming," Kemp says. Divestment is a controversial tactic even among those working on climate change solutions. Andrew Holland is an energy and climate fellow at the nonpartisan American Security Project in Washington D.C., which researches the impact of climate change on national defense. "There are effective ways to fight climate change and there are ineffective ways to fight climate change," he says. "And I think that the divestment movement fundamentally is looking in the wrong direction." Endowments at the 500 richest U.S. colleges and universities are worth nearly $500 billion. It's not known how much of that is invested in fossil fuels companies. But for some perspective, NYU, Bowdoin and Middlebury have all recently disclosed this information, and fossil fuels make up between 1.4 and 5 percent of their endowments. Financial experts say even full divesture would have little impact on the energy industry. And the moral argument doesn't hold water with Holland. "Stigma doesn't work for the fossil fuel companies," he says. "These companies are already stigmatized. You're not going to stop Jim Inhofe or other hard right Republicans from taking money from fossil fuel companies because a bunch of professors at Stanford or Swarthmore determine they don't like ExxonMobil." Plenty of student movements have begun and ended without the targeted industries batting an eye. Today, though, anti-fossil fuel activists claim kinship to the anti-Apartheid divestment movement of the 1980s, which also started on college campuses amid choruses of criticisms.